The Nasi Bungkus Roundup: 5 Banana-leaf Wraps, 60 miles. A marvelous description, to be sure, yet that opening line bugged me. I remembered Linda Burum's LA Times article about that same dish - at Java Spice in Rowland Heights. Granted theirs is only available on Saturdays and Sundays. But what about the restaurant just across the street from Indo Cafe, Simpang Asia? I was pretty sure they had nasi bungkus. In the end, I decided to do a round-up. Yep, a nasi bungkus round-up. Because if you do scour - forget California, let's just focus on LA County - you can find other nasi bungkus. First thing's first. What in the world is nasi bungkus? The name itself just translates to "wrapped rice" and the dish is just that. Rice wrapped in banana leaf along with whatever lauk - meat, vegetables, or other accompaniments you'd want to put in. It really refers more to the packaging and a way of getting some food to-go than what is inside and is as ubiquitous in Indonesia as bento boxes are in Japan. While the idea was that the banana leaf (natural and ubiquitous) will hold the oil, moisutre, and sauces in, it certainly didn't hurt that its fragrances seeps into the warm rice. 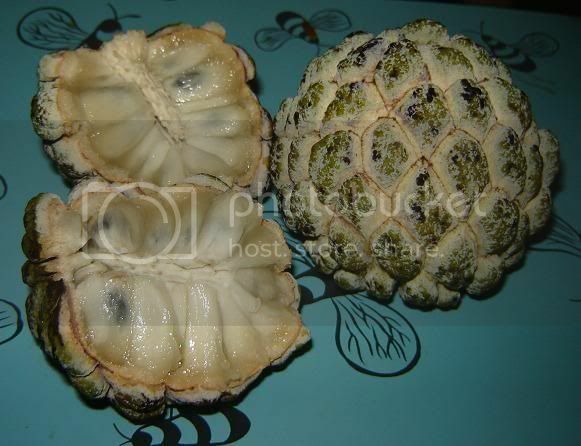 These days and in LA in particular though, certain staple items are expected to be found inside. An egg. Some beef rendang. 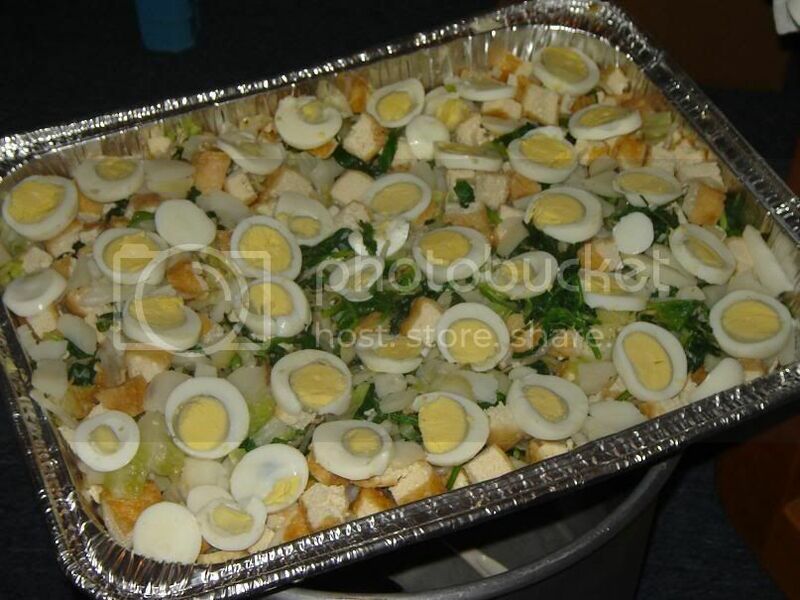 Some sort of chicken, and of course some sort of vegetable medley. I ordered a nasi bungkus to go (because that's what nasi bungkus was meant to be in the first place). They wrapped the rice and further put it in a styrofoam box - a little redundant? - with a side of shrimp chips. In this nasi bungkus ($6.99) they put white rice, chicken, beef rendang, vegetable curry (lodeh), potatoes with chicken gizzard, Balinese egg. Their chicken was surprisingly tender, but unfortunately the rendang wasn't as tender as it could've been. My favorite part was the morsels of delicious chicken gizzard chunks. The lodeh was also flavorful without being too spicy. 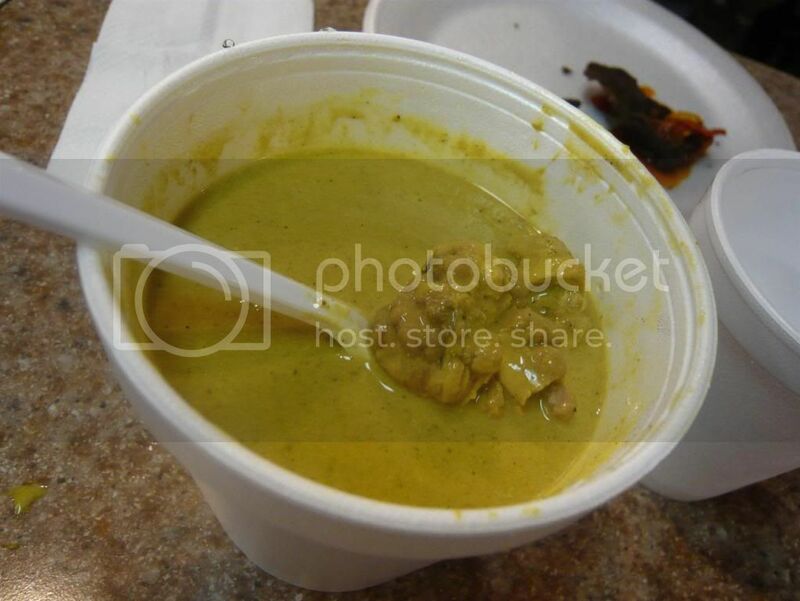 Since lodeh is a coconut-based vegetable curry, it adds a richness to the dish and the part of the rice that has soaked up this curry sauce was incredibly delicious. The rice itself is for the most part fragrant after having been wrapped inside the banana leaf. 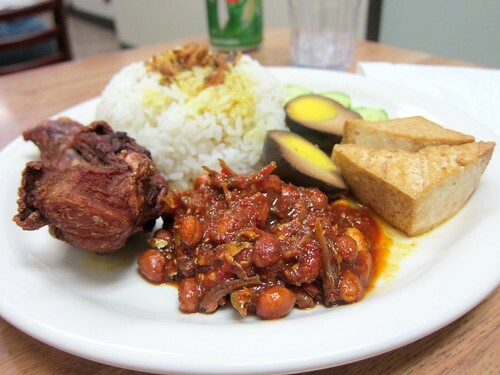 Indo Cafe's nasi bungkus contained white rice, beef rendang, green beans, hard boiled egg, chicken curry, tofu/tempeh curry. 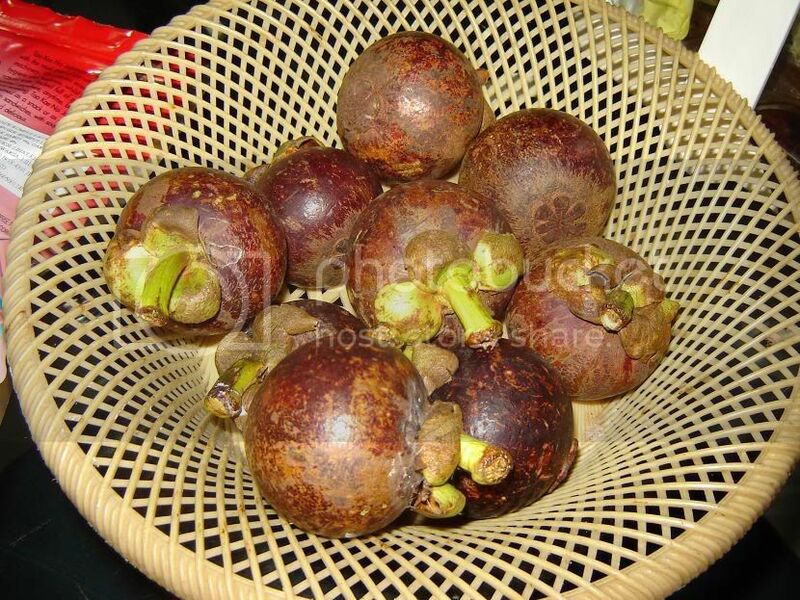 This was served with a dollop of green chile, which is traditionally from the Padang region in Sumatra. The rice did receive some fragrance from the banana leaf, but it wasn't as moist as Simpang Asia's. The beef rendang was more tender, however, and more than makes up for it. Surprisingly, my favorite part of the dish was the curried tofu and tempeh. The tempeh here was one of the better ones in the city, chewier and not as dry as others. At one point I managed to enlist Wandering Chopsticks and Sinosoul and dragged them all the way to Rowland Heights for the LA Times-mentioned nasi bungkus at Java Spice. Since it received such a great write-up and is only available on the weekends, Java Spice was packed on a Saturday night and service was painfully slow. All that aside, let's focus on the dish we came for. Inside: rice, marinated fried chicken (ayam kalasan), tofu, tempeh, telur kecap (egg boiled in soy sauce), and of course, beef rendang, jackfruit curry. 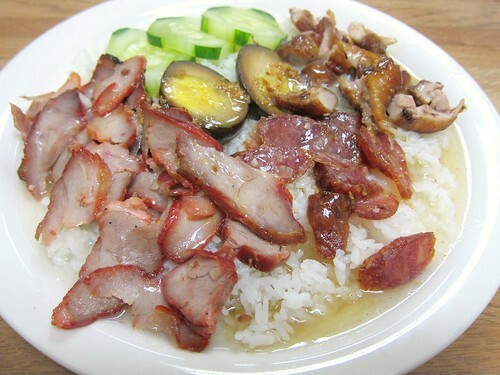 The rice was particularly fragrant and brought this dish to a whole new level. It was much more fragrant and rich I was suspecting that it might've been coconut rice, but it might've just been the results of the curry and sauces seeping through. The ayam kalasan was disappointing as it was too sweet, a little tough and didn't really go with the rest of the dish (so I thought - chicken curry in my nasi bungkus please). Putting the chicken aside, everything else was great. The rendang was very tender and so was the jackfruit curry - usually a rare sight unless you're eating nasi gudeg. I thought I was almost done but just to check I called other Indonesian places that I knew and found yet another one that serves nasi bungkus! Like Java Spice, the nasi bungkus at Sate House is also only available on Saturdays and Sundays. I had to make this trek twice because the first Saturday I went they had already run out. I was on a mission, however, and thus made the 23 mile drive again the next weekend. A little different this time. The beef rendang was there, with fried chicken and egg, but the green beans with tofu and tempeh were not curried but just boiled, and the whole thing was topped with some stir fried vermicelli. Probably the least spicy of the five, I enjoyed this one quite a bit with the fork-tender beef and moist and tender chicken. The vermicelli was quite a nice touch as well, adding another dimension of texture. I saved the furthest restaurant for last but finally made my way down to the 562 area, Bellflower. 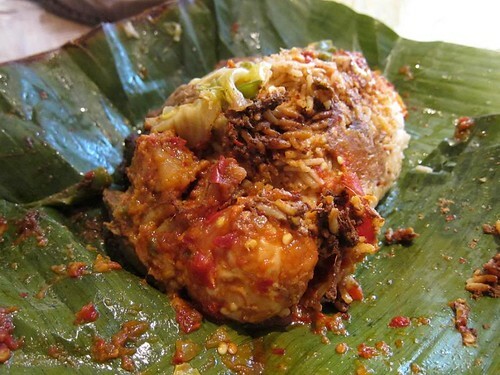 The nasi bungkus from Toko Rame had gotten a write-up a few years ago from Elmo Monster, a fellow foodblogger from Indonesia whom I unfortunately have not met. Upon picking up my order I immediately thought "Wow, this is the heaviest one yet!" and upon opening it and seeing the red pile of rice, thought "Uh oh, this is gonna be the spiciest one .."
I sat a big bottle of water next to me and I was ready. Some people complain that the beef rendang found in this part of the world is just not as spicy as back home. Well, Toko Rame's is still not as spicy but it sure does pack a heat. The beef was earthy and tender, the chicken a little dry but had a nice turmeric flavor. The boiled cabbage on top was contrastingly unspiced which helped me tone down the spiciness but on the other hand could be detracting. Toko Rame already mixed the rice with the chili paste for you, you see, instead of putting a dollop in a corner. The end result is an amazingly spicy and flavorful rice that you won't be able to stop eating even after you've finished all the meat and vegetables. If you can't, don't worry, just rewrap the rice for the next day... back in the banana leaf, of course. It all started with Sinosoul's comment on my IndoKitchen post. "Where are the brains?" he asked, so I shot him a quick email. I know just the place for Indonesian cow brains. Sinosoul and his lady, Wandering Chopsticks, Kung Food Panda, and Food Marathon joined me at Raso Minang, a food court outpost in the Hong Kong Plaza all the way in West Covina. 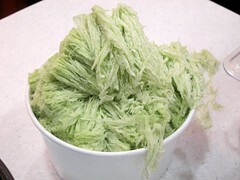 It is typically shaved ice with condensed milk, syrup, cassava, and coconut but here the ice and syrup has been blended into a smoothie. 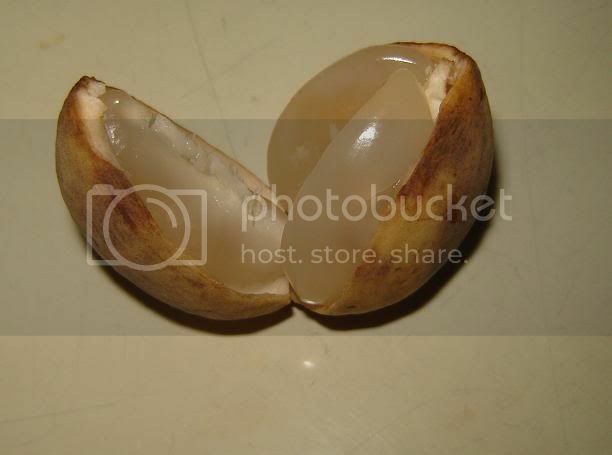 Raso Minang also sells whole coconut (in the shell). The other items we got was the Beef Rendang (left) and Beef Feet Curry (Gulai tunjang). These are both spicier than the brain curry, although not as spicy as Food Marathon wanted it to be :P I quite like the rendang here, it's pretty tender and spicy and doused in curry as it should be. 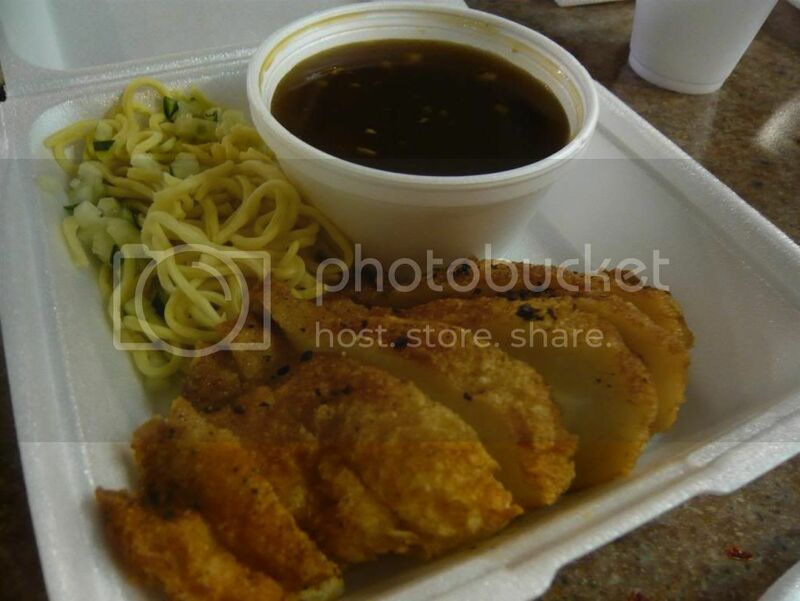 This is quite a good rendition of pempek, with chewy and flavorful fish cake with crispy fried skin. A hit with the table and perhaps the best version I've found in LA to date. West Covina is pretty far, so I wouldn't come here often, but if you're looking for good Padang food in the LA area, or have been dying to try brain curry, well now you know where to go! Indonesian cuisine in Los Angeles is not as common as Thai or Vietnamese, but as a student living in LA indefinitely, I still have to try some good representation of my country's cuisine. I've tried out the Indonesian restaurants on the westside through downtown, and also Pondok Kaki Lima at Duarte Inn, but there are still a few restaurants in the SGV I have yet tried. So, to celebrate my exam passing a couple months ago, I had a pre-party dinner with Wandering Chopsticks, Kung Food Panda, and an old classmate, at Indo Kitchen in Alhambra. 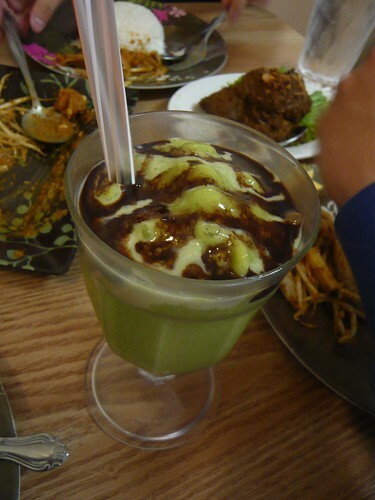 I like avocado smoothies with chocolate syrup which is a typical Indonesian dessert, so of course I got one here - I'm celebrating after all. Unfortunately the one here is not so great. It tasted like the avocado was not fresh, and the shake had a bitter aftertaste. I didn't manage more than a few sips. As a starter I ordered the Ketoprak, which is a Javanese dish typically consisting of tofu, vermicelli, bean sprouts, etc, in peanut sauce. A pretty good rendition, albeit it doesn't have all of the usual ingredients. 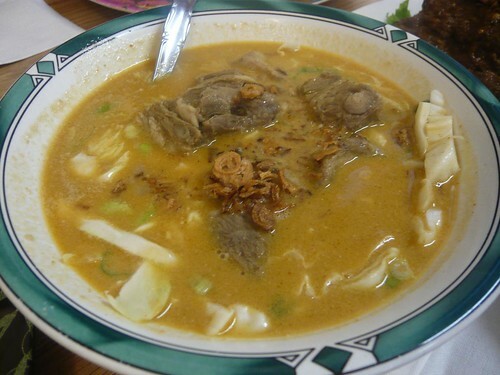 We also got one of my favorite dishes from childhood - goat Tongseng. 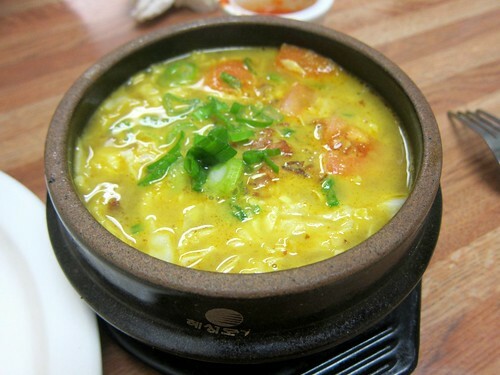 We usually make tongseng from leftover goat curry by adding vegetables (mainly cabbage) and then eat this the next day. 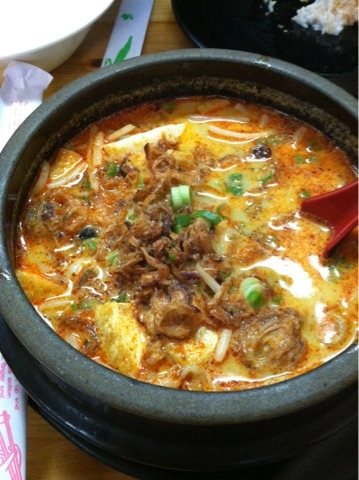 Tongseng is usually not as spicy. 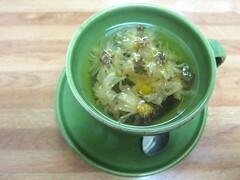 The tongseng here is pretty good. The goat is a bit gamey (which I like) and tender, the flavors and spices are right on. We also got their special fried chicken (I don't know why I neglected to take a photo of this!) which were also pretty good and flavorful. 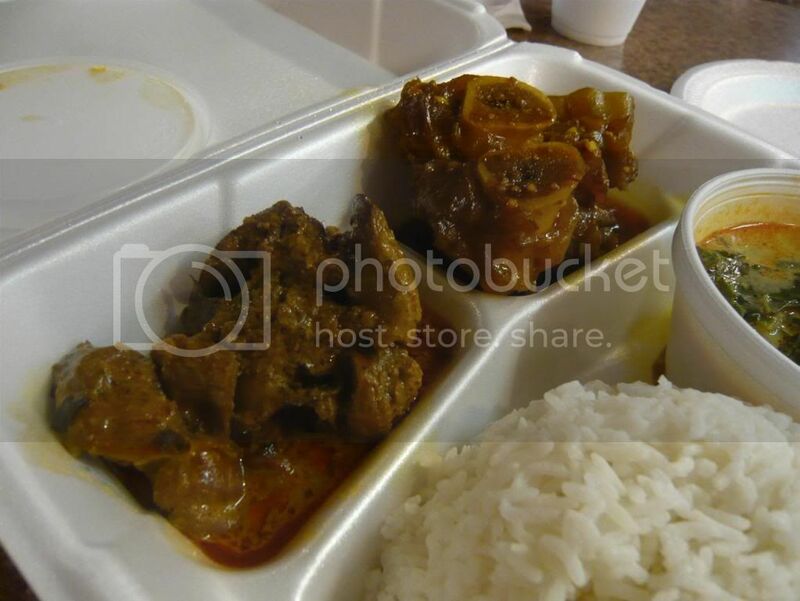 Of course, we also got some rendang for Kung Food Panda who was new to Indonesian food. 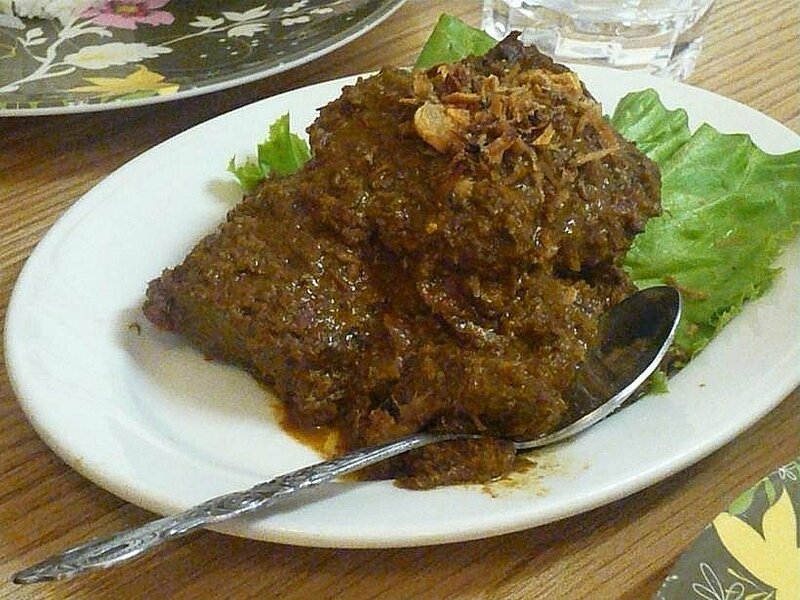 Rendang - braised beef curry, is a safe dish that people usually recommend to the newbies. The rendang here is not bad, but could be better. Normally you would use smaller chunks of meat such that the result is more tender, easily cut with just the tip of your fork. Since Indo Kitchen uses bigger chunks, the meat is not as tender as it could be, and the sauce doesn't seep through into the meat completely. Still a pretty good dish - the meat is not tough and the sauce is flavorful - but could be made much better with just one simple change. Overall a pretty good Indonesian restaurant, and I think the conclusion is mostly the same as the other Indonesian restaurants in Los Angeles. Indonesian cuisine spans thousands of islands with different cultures - and food cultures. It's impossible for one kitchen to get them all right, so at each place, order wisely and you'll be satisfied. Pondok Kaki Lima in Duarte Inn was close to being a mecca of Indonesian food - then it got shut down by the local authorities. After negotiation with the city, they finally managed to get back up on their feet and reopened in January 2009. 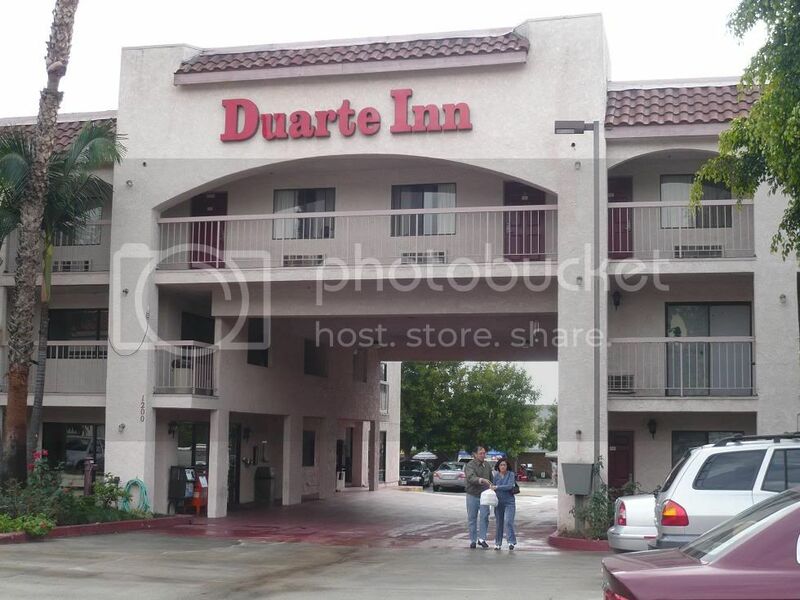 The Indonesian food fair is held behind the Duarte Inn every Saturday afternoon. A bit of background, Pondok Kaki Lima literally means Five Feet Hut (Pondok=hut, kaki=feet, lima=five), but don't let that confuse you. 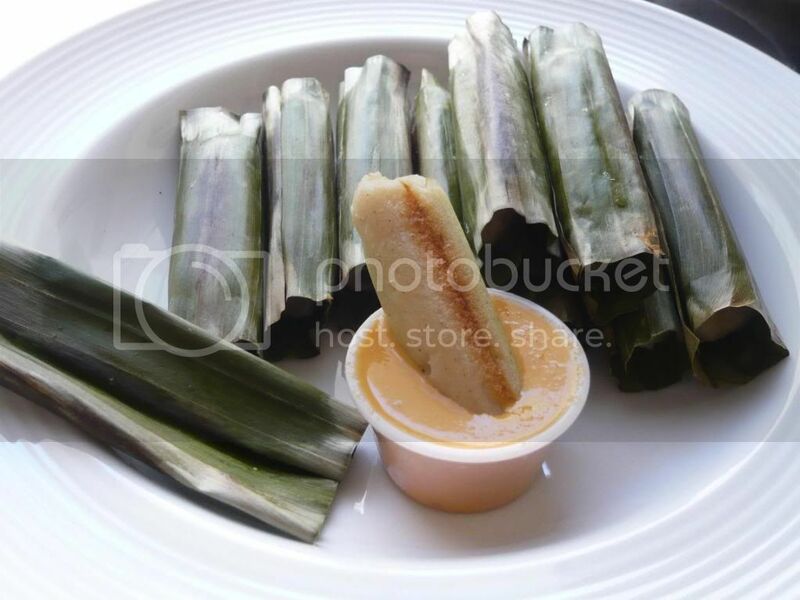 Pondok kaki lima is the phrase we use to call street food vendors. 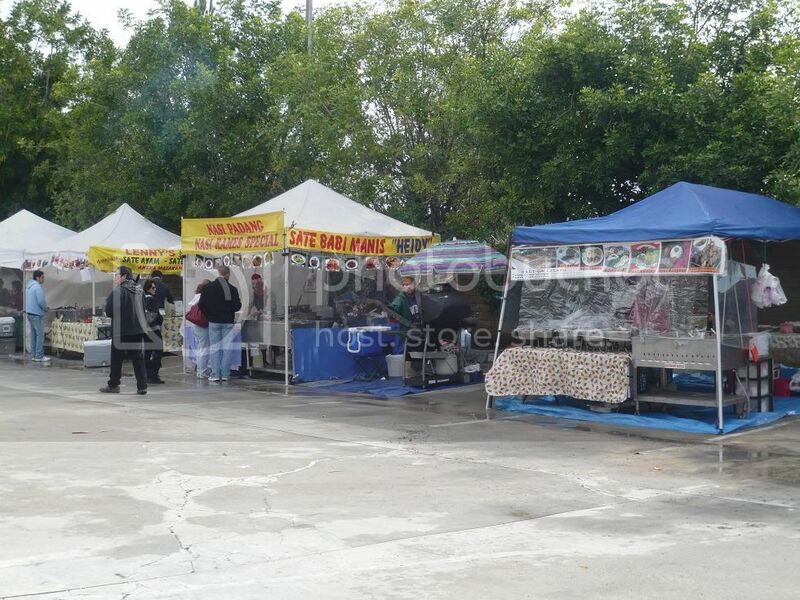 So, as you can expect here, tents of street vendors occupy the lot in Duarte Inn, sellling food items from satays, rendang, to drinks and desserts. I've been wanting to hit this place again since its reopening and finally had my chance when Wandering Chopsticks said that she was free. Off we go! Right in the same complex there is an Indonesian restaurant also an Indonesian grocery store - so in case you found yourself there when the PKL is not operating, you can still get your indonesian fix. The Indonesian restaurant is a bit misleadingly named Chicky BBQ & Grill. 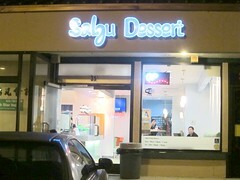 I have yet to try it but it is apparently one of LA&OC Foodie's favorite lunch spots. The more common options here involve getting a rice plate with three or so items. 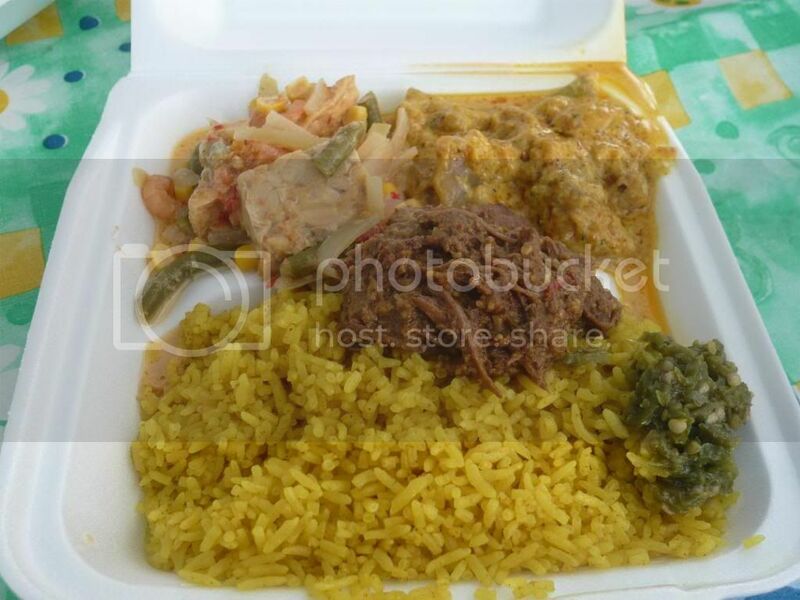 We got a plate of nasi kuning (literally, 'yellow rice') which is turmeric rice, with rendang (slow cooked beef in coconut milk and spices), tendons, and sayur lodeh (vegetables in coconut milk curry). As you see, almost everything involves coconut milk (aka kentan). 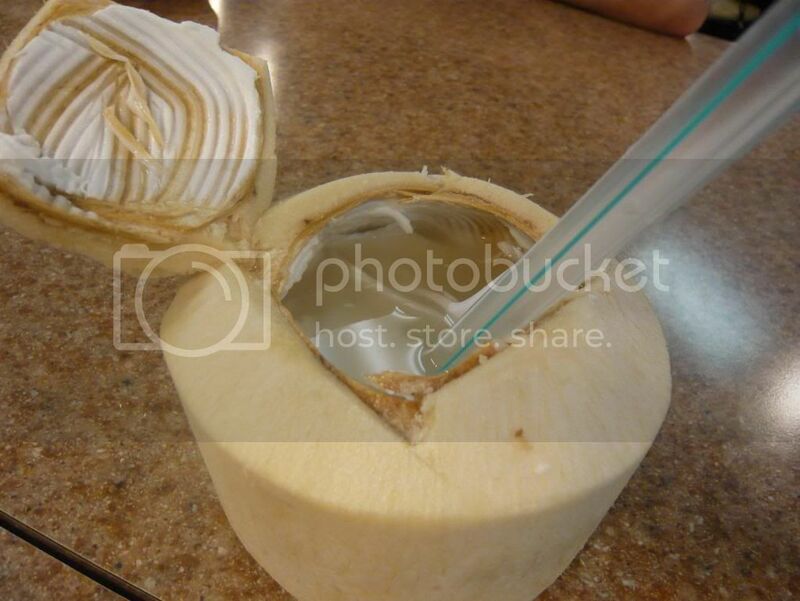 We love our coconut milk! The rendang here is pretty good. Rendang is supposed to be slow-cooked and thus should be very tender. Many places are lazy and just cook it with spices or ready-made seasoning that results in tough beef cubes. Not here. The rendang was tender and spicy. The turmeric rice was fragrant. I liked the lodeh, although WC did not. Maybe it's an acquired taste? I thought it was a pretty good, albeit milder, rendition of Indonesian lodeh. 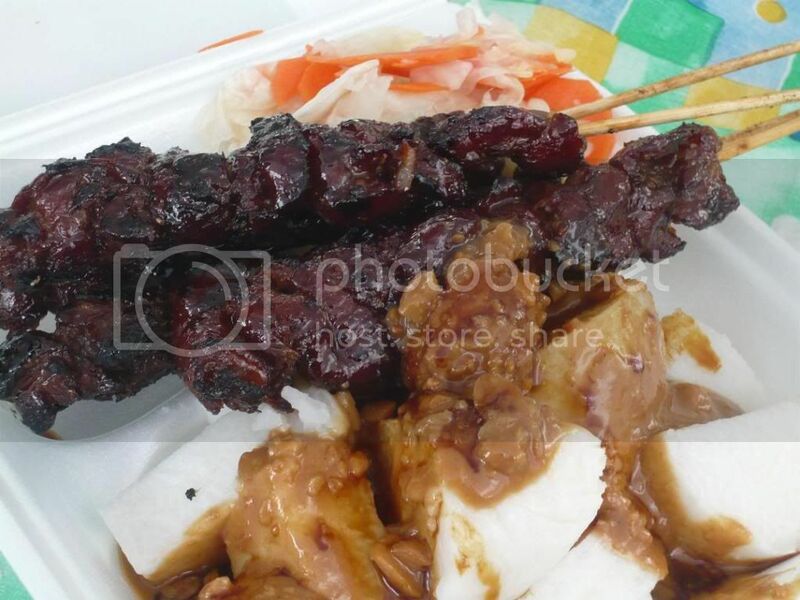 We also got some pork satays from "Sate Babi Heidi" (pork satay Heidi), served with some lontong in peanut sauce. 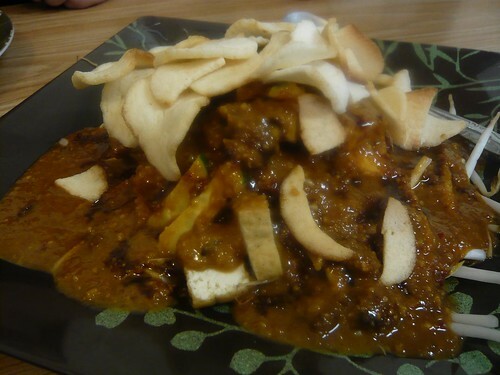 Lontong is rice cake made with tightly packed rice cooked in banana leaves and most commonly eaten with peanut sauce. When you eat sate (satays), the lontong accompaniment is a must. Starting on Friday, January 16th, Simpang Asia will stay open until midnight everyday! 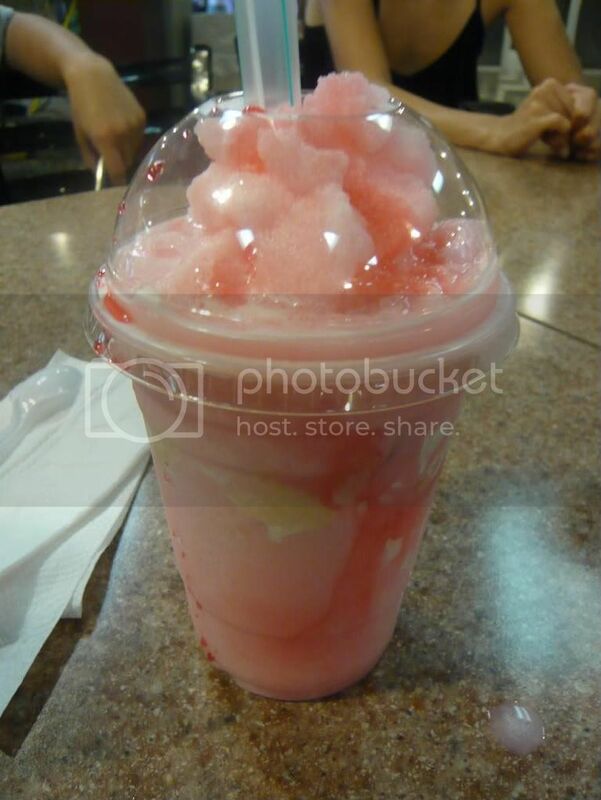 This is going to be awesome for my late night cravings! Great news! 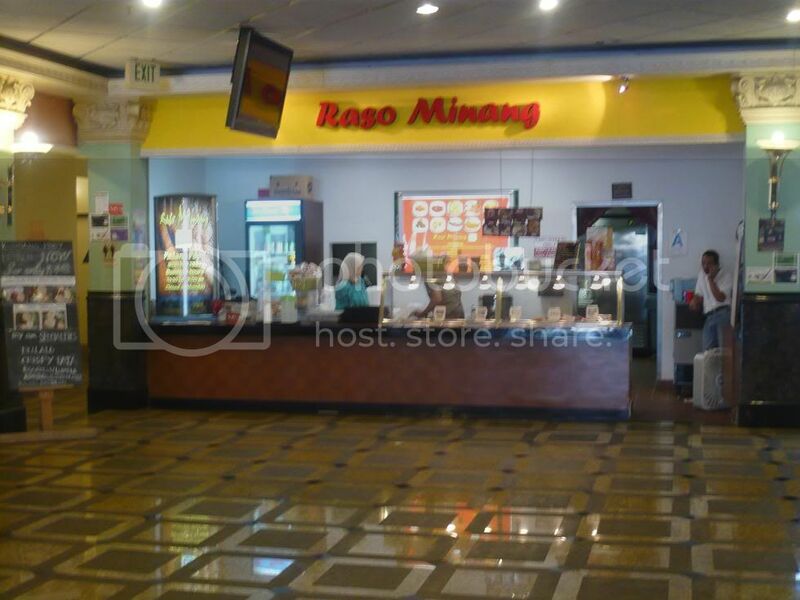 Pondok Kaki Lima, the Indonesian Food Fair in Duarte Inn will reopen on January 17, 2009 !!! They are going to open every Saturday start at 10:00am - 02:00pm except on January 31, 2009. On Jan 31, 2009 PKL will be at the Chinese New Year Bazaar in Hacienda Heights. I'm not just saying this because I'm Indonesian ... but we Indonesians make the best instant noodles out there (although no I've never tried the Japanese $3 instant noodle packages because with that kind of money I'd rather go to a food stall and eat a fresh bowl). 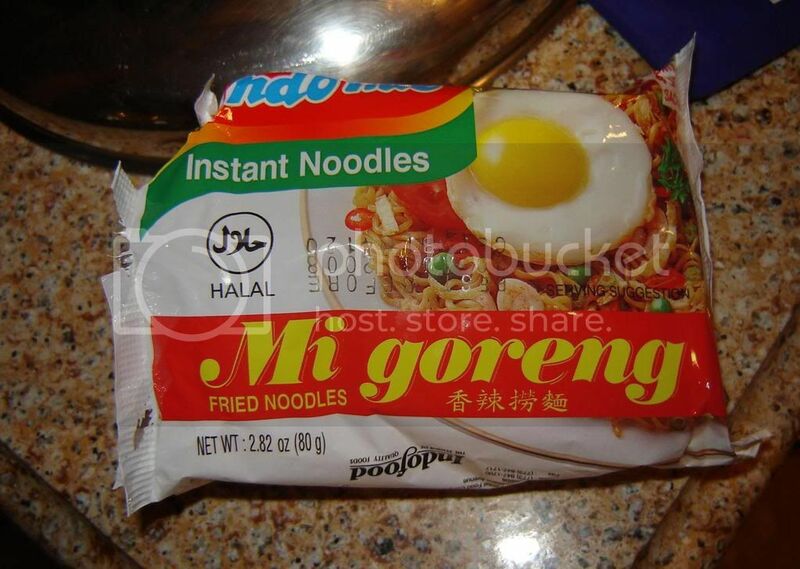 Indonesian's "Mi Goreng" literally means "Fried Noodles". 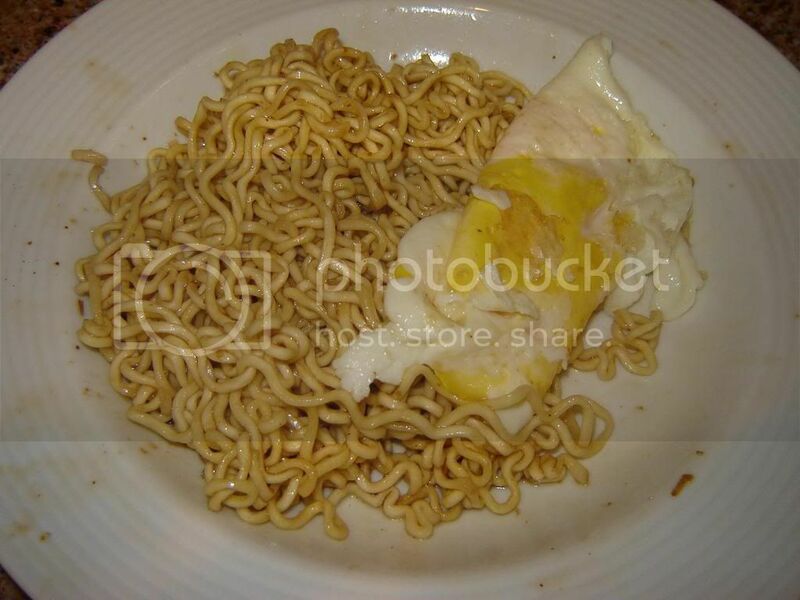 The most common one is the one produced by the company "Indomie" : Just like the name suggests, you're supposed to be getting "fried noodles" so you're supposed to drain the water after boiling the noodles, and THEN put the sauces in and mix it. (I've given it to a friend who didn't read the instructions .... and then asked why the soup is so bland ...). 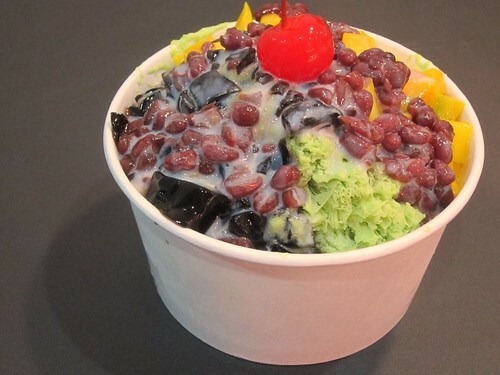 It's bold in flavor and probably has a lot of sodium ... but it's good >_< !! Just a quick post ... we've been really busy preparing for the International Food Fair at Caltech. Just this year we decided to form a formal Indonesian club at our school, and then decided to participate at the food fair also. Since our budget was limited, we had to make a lot of the food ourselves. We also made "Cendol" but you can barely see anything in that big pot, so I didn't take a picture. 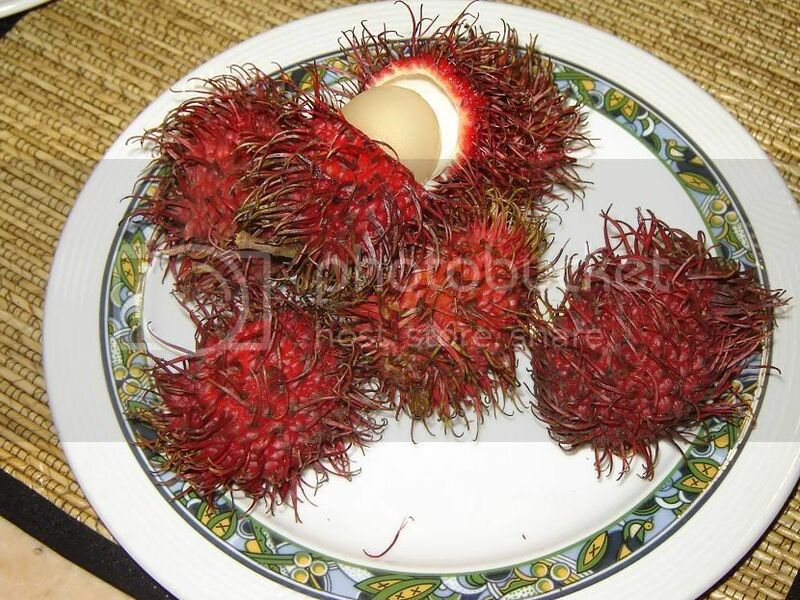 We also had some snacks/desserts that were catered by an Indonesian lady living in LA. 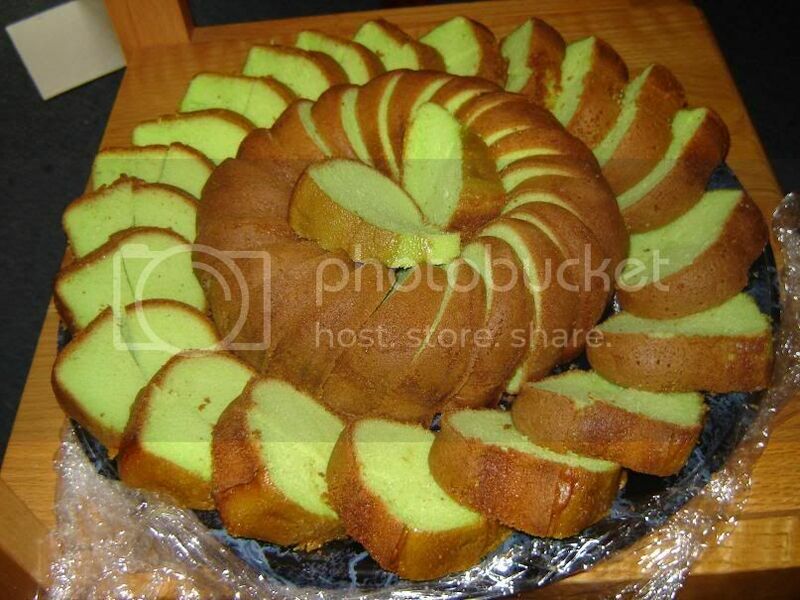 This here is the "bolu pandan"